I was so saddened to hear of Aiko Herzig Yoshinaga’s passing. To initially see Aiko in person, you saw a tiny, attractive grandmother with a ready smile on her face. Even when she spoke, she was not the stereotypical activist leading the good fight in a loud voice. She spoke rather softly but with a conviction that communicated she would brook no argument with what she saw as an unwavering commitment to right and justice. My introduction to the terminology issue by Aiko came in 2007, prior to the annual Manzanar Pilgrimage. We were members of the Japanese American Historical Society of Southern California (dissolved in 2015), and the JAHSSC sponsored a bus from the South Bay for 14 years. To supplement the program on our bus, I wanted to have a session that allowed for more discussion. My daughter, Traci, helped organize the dinner meeting at my home, and we contacted Dr. Don Hata and Aiko. Initially, it was to be a discussion that would give the background of the incarceration, but, instead, Aiko wanted to discuss the correct terminology issue. I have to admit that the discussion was uncomfortable for me. I was a toddler at Manzanar and grew up using the typical language for the past 63 years of my life. “Concentration camp” and “prisoner” sounded so harsh to me because of the association to the Jewish Holocaust. Aiko’s logic and historical explanations of the definitions of the terminology made sense and I could accept it academically. I decided that relearning the “language” of the past 63 years took a conscious effort. Like anything, constant repetition made the new language part of my regular vocabulary. In the fall of 2017, I worked on a committee chaired by Miya Iwataki of the Little Tokyo Historical Society. It was a two-part program held at the Gardena Valley Japanese Cultural Institute featuring two films by filmmaker Janice Tanaka, which dealt with the fight for redress and Aiko’s life in her role for redress. Both films actually had Aiko as an integral part. Aiko was scheduled to be on the panels of both programs, but she was ill and could not take part, much to the disappointment of all. However, Martha Nakagawa and Don Hata represented her more than ably…two people that probably know her the best of anyone, next to her family. 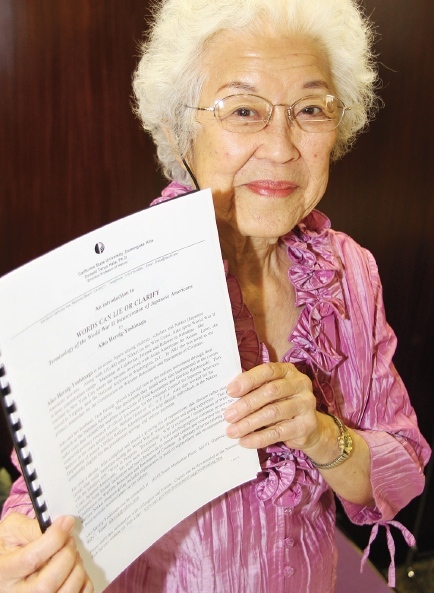 In fact, Aiko relied heavily on Martha to help with cataloguing the materials she and her late husband, Jack, donated to the Asian American Studies Center at UCLA. Aiko told me Martha was the only one who could do the work. I think the boxes numbered around 150 (maybe more, I don’t remember). Aiko and I both lost our husbands, days apart, in August 2005. George on the 16th and Jack on the 21st. The 21st was the day when Nisei grads of LAUSD finally received their high school diplomas denied them back in 1942. The event, held at L.A. Trade Tech, was chaired by Aiko’s son-in-law, Warren Furutani, whom we all know. George and I were on the committee, along with Min Tonai, Bill Shishima, Rinban Noriaki Ito, Dianne Belli, Dr. Jack Fujimoto, Toni Tomita, and John Ikegami.